This isn’t really a bug in Neo, and I don’t thiink it’s a bug in mobile switcher either, but Mobile switcher doesn’t work when I have W3 Cache enabled in any kind of way. If I do get it to work, then as soon as I do an update to, or add a new post…all goes out the window again. I’ve been having a problem with w3 anyway when it comes to minifying like it’s supposed to, unless I set minify to “automatic” on the General Settings Page of the W3 Cache plug-in, but even when things minify correctly, if I make one single change, then the mobile switcher will not work. I’ve looked for about an hour and a half and in order to make sure nothing in my .htaccess file isn’t messed up, but all I really need to know is if what I have in it already is correct, and since it will take Syahir about thirty seconds to tell me if it’s right, I figure I might as well just ask (but I am trying to learn a little bit about Apache and how .htaccess rules work. Here’s what I have in it now. If someone could tell me if this is correct, then I will at least know that I can maybe try another caching plugin (because I really do not need one as fancy and powerful as W3 just to cache pages (really don’t care about minifying right yet), or start disabling a couple of plug-ins and seeing where the conflict is (because it started way before I ever tried the first graphene mobile theme, so it’s not graphene). 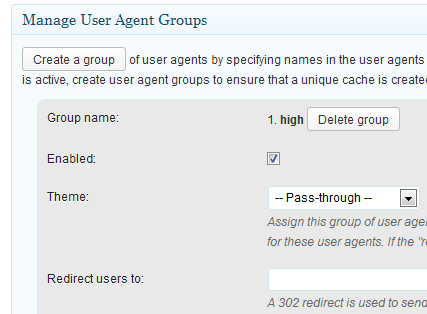 Have you enabled the “User Agent Groups” option in W3TC? You need the enable both the “High” and “Low” group, and set the theme to “– Pass-through –“. Wow. See, that’s why I broke down and asked you, lol. Thank you again for your patience and help. That fixed the problem and saved me a whole lot of time. You’re welcome! Marking thread as resolved then. You can do this yourself as well.